Ice cream, for me, is a year round food. It doesn’t matter how cold it is outside or what season it may be. I just make the flavor go with the season. 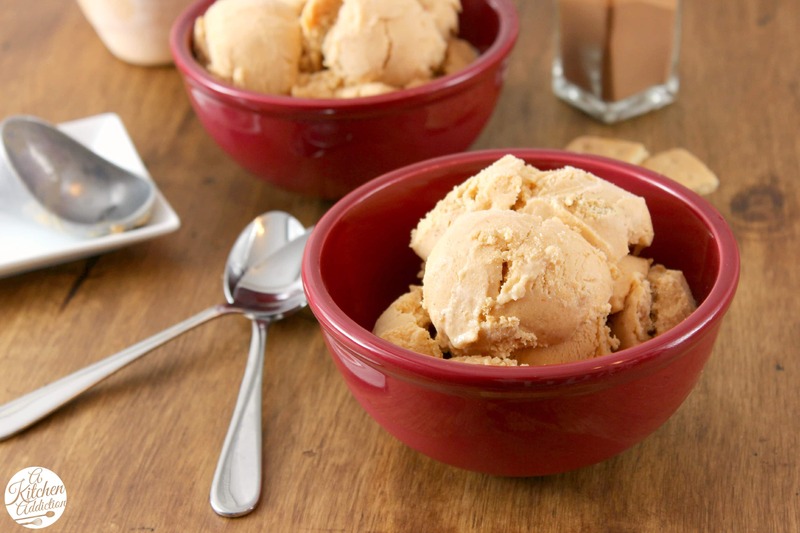 Take this pumpkin pie cheesecake ice cream, for instance. Most people are starting to think about pumpkin pie for Thanksgiving. I’m thinking about ice cream. So, I make a pumpkin pie flavored ice cream! Since I’m actually not a huge fan of plain pumpkin pie, I would gladly take a big bowl of ice cream over a slice of pie! Of course, I can’t just stop with a plain pumpkin pie flavor. 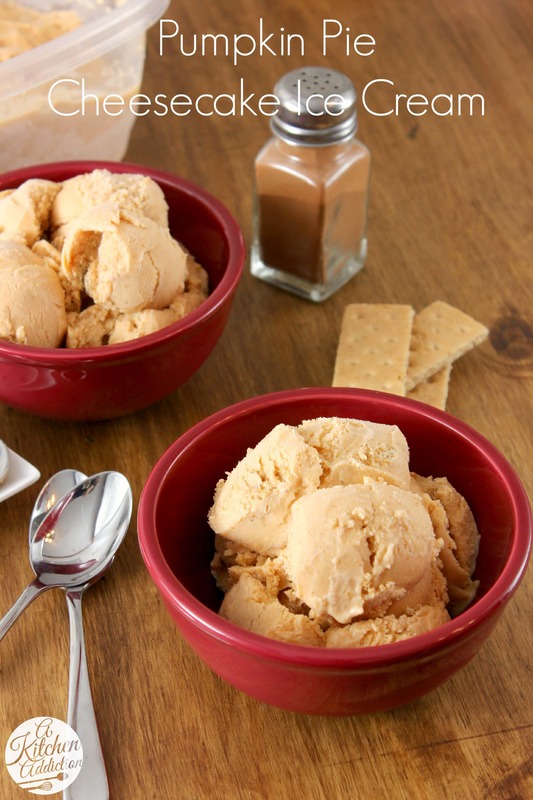 Rich cream cheese and some crushed graham crackers are added to give extra flavor and a bit of crunch to this sweet, creamy ice cream. The result is a fun variation to a classic fall dessert (and you don’t even have to make a pie crust!). 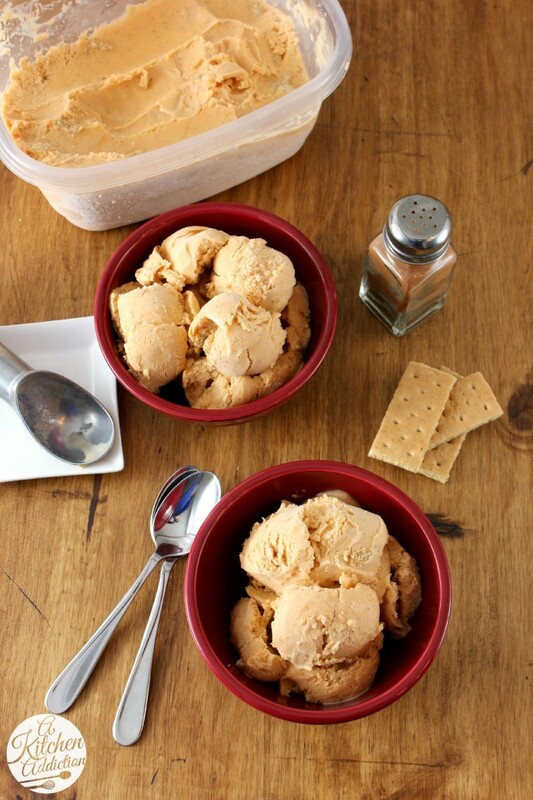 So, if you’re looking for a way to switch up your Thanksgiving desserts, or if you just love ice cream, you need to give this easy pumpkin pie cheesecake ice cream a try this season! In the bowl of a food processor or in a blender, add sweetened condensed milk, cream cheese, vanilla, salt, pumpkin, brown sugar, cinnamon, nutmeg, cloves, and ginger. Pulse until well-blended. Pour mixture into a large bowl and gently whisk in milk. Pour milk mixture into ice cream machine and churn according to manufacturer's instructions until ice cream is soft set. Pour ½ of ice cream in a freezer safe container. Sprinkle with half of crushed graham crackers. Pour remaining ice cream over top. Sprinkle remaining crushed graham crackers on top. Gently swirl a knife through ice cream and graham cracker layers. Place ice cream in freezer to finish freezing or serve soft set. I am in lurve with this ice cream. I agree, ice cream is a year-round treat. Pinned! Ice cream is definitely a year round food! In fact I had some yesterday with it being 50 degrees outside. I stopped making ice cream back in August before we moved. I probably won’t make more before next summer but I am all for eating it all winter long. Love pumpkin ice creams in the fall. This looks marvelous! This isn’t even fair…I don’t have my ice cream with me at school, but this is SO getting bookmarked for when I’m back home. Looks amazing! I’m with you – ice cream is definitely a year round food! I bet this flavor is out of this world! What an amazing combo of flavors! HELLO! This looks too good, Jessica! Ice cream is delicious no matter the weather! Gorgeous, and fantastic. I love pumpkin ice cream! Oh my gosh this looks absolutely delicious! So beautiful!! This ice cream is delicious and I can’t get over the addition of crust in it. Love! Oh, I want this so bad. Forget dinner…I want this ice cream! 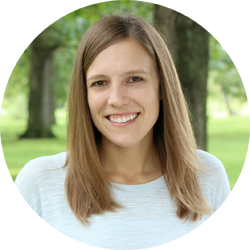 Looks SO good, Jessica! Lovely sweet ice cream, pumpkin and cheesecake is the duo killerr! btw, what did u mean by fat cream cheese??? isn’t it whole/unskimmed creame cheese??? The ingredient is 1/3 of the fat cream cheese. So, it’s a lighter version of regular cream cheese. This ice cream is making me so happy in my heart! Gorgeous! Very interesting! I always said the ice cream tastes like pumpkin pie with a lot of whipped cream. But, fat-free?It’s the holidays! Oh man, pumpkin pie PLUS cheesecake in an ice cream?! Sign me UP!